Every year when in late May and early June the first Strawberries emerge on our markets and on my balcony my heart jumps of mere joy. 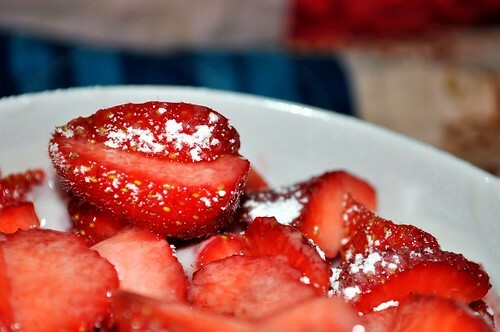 There is hardly another fruit that I am so in love with than strawberries. I love their sweetness and their heavenly fruity taste. Most of all I love that basically all you have to do is pick them off their plants and stick em in your mouth. There you have that sweet explosion in your mouth - nothing else needed. 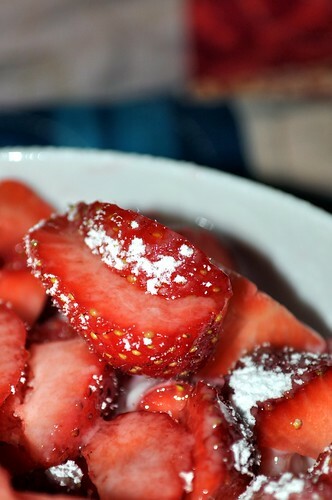 My second best choice is grab some greek yoghurt, some strawberries and a bowl, combine them together and sprinkle with a little vanilla scented caster sugar - not much just a little bit on top. Heaven! Sadly enough real Strawberry season is over way too quick and those little precious gems disappear as quickly as they appeared at local markets and supermarkets. :( One way to preserve their sweet and fruity taste is to make strawberry jam using just enough sugar to not destroy the fragile taste of my favorite fruit. Refrigerating the whole fruits did not yet give me satisfying results I was hoping for. Doubtless God could have made a better berry (than the strawberry), but doubtless God never did. Although St Hildegarde of Bingen considered strawberries to be a kitchen toxin - I do disagree here. Modern science says that one cup (144 g) of strawberries contains approximately 45 calories (188 kJ) and is an excellent source of vitamin C and flavonoids which sounds pretty good to me. Also they are very low in Saturated Fat, Cholesterol and Sodium and are also a good source of Folate and Potassium, and a very good source of Dietary Fiber, Vitamin C and Manganese. The only downside is that a large portion of the calories in them come from sugars...however the natural sugars in strawberries will not adversely affect your blood sugars because they contain mostly fructose and fiber so anyone can enjoy a serving of strawberries, including diabetics.